Mr Nick Savage, master distiller at Macallan - one of the best-selling whiskies in the world - is all of 38. But it is not just his youth that sets him apart from his counterparts in the industry. Born in Sheffield, England, he is also not a Scotsman, unlike most master distillers in the industry. Hence for him, it is about leveraging the company's almost 200-year legacy, encompassed in the knowledge and experience of the people working there. "If you're taking on something of that magnitude, the people who are going to know the most about distilling are the guys who do it every day - working the stills, mashes and cooperages," he says. So he would work out where the knowledge is and tap that. "My approach is never just turn up and say, 'Right guys, I've cracked it.' I'm going to say, 'What do you think about this? What's your take on how to build a brilliant cask?'" Since joining the Speyside single-malt distillery in March last year, he has overseen the release of The Macallan Edition No. 3, which was launched here last month. It is part of the brand's non-age statement Edition series that centres on Macallan's commitment to wood. "Because of the lead time required with ageing whisky, you're starting to see the things I've been working on come through now," says Mr Savage, who was in town recently. He was also part of the launch of the Macallan Quest collection last month in Cannes, France. The line comprising four expressions - Quest, Lumina, Terra and Enigma - is set to replace The Macallan 1824 Collection in global travel retail. The Quest is created using four cask types: European and American Sherry-seasoned oak, American ex-Bourbon and hogshead casks. Lumina is matured in European and American Sherry-seasoned oak and hogshead casks. Terra uses exclusively first-fill Sherry-seasoned casks from the Tevasa cooperage in Spain and Enigma is matured exclusively in first-fill Sherry butts. The new line will roll out at Changi Airport on Jan 1 next year, one month ahead of other markets. He will also be at the helm when the company's new £100-million (S$179-million) distillery and visitor experience in Craigellachie, Scotland, opens to the public next summer. "The concept was not necessarily that we need to increase capacity," he says of the new grounds. "The stimulus was that we've got this phenomenal brand, so how are we going to exemplify that in a visitor experience?" He was tight-lipped about the subterranean space that is rumoured to have the world's largest mash tun (a vessel for the mashing process). But he says: "My challenge is that, in 12 years' time, we don't see any change and (the customer) won't be able to detect it in the whisky when we turn the new distillery on." He describes his role with the distillery as a "custodian", covering a broad spectrum of responsibilities. These include looking after cask quality, monitoring the stock as it matures as well as "working with my team at the end of the other side of the 12 years of ageing, where the final product is pulled together". That is just for the standard Macallan portfolio which comprises The Macallan Fine Oak, The Macallan Sherry Oak and The Macallan Double Cask, among others. The Briton, who has a PhD in mechanical engineering, answered a job listing to "optimise whisky casks" in Diageo, which led to eight years with the company, including a role as Cask Science and Warehouse research manager. He also spent time at family-owned Scottish spirits company William Grant & Sons before moving to Macallan. Having moved from brand to brand, he insists that "scotch is like a community in itself, regardless of which brand you're working for". "The way I see it, I'm going to sit in this chair for a certain period of time, so you have to make sure you grow and do right by the brand. A lot of people have sat in it before you, so you have to make sure the guys coming after you can take the brand on as well. In the lead-up to the festive season, pick up and sample more than 250 craft beers, ciders, sakes, minimal intervention wines and small-batch spirits at the inaugural edition of Alt Mkt (short for Alternative Market), a festival celebrating alternative spirits and wines. Held at UE Square's Skylight Atrium from Friday to Nov 19, the products - ranging from craft beers by New Zealand's Garage Project to bottles of Melbourne Moonshine - will be priced at 25 per cent off their regular retail price. 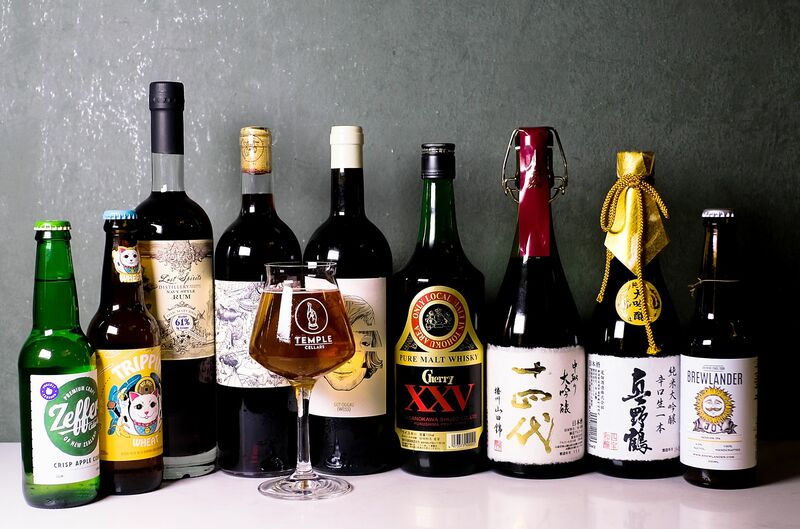 Organised by independent premium liquor store Temple Cellars, there will be daily sampling sessions from noon to 3pm and 5 to 8pm, as well as a series of masterclasses (from $25 to $80 a class). On Saturday, taste minimal intervention wines at Sip and Savour: A Taste of Nature ($25), which will feature selections from Austrian wineries Gut Oggau and Claus Preisinger, South African winery Testalonga and Sam Vinciullo from Australia's Margaret River. Participants can learn how to make a bespoke leather flask cover at a whisky and craft leather workshop ($80) on Nov 19. There will also be a tasting of three small-batch whiskies as part of the workshop. Food options will also be available from smokehouse Meatsmith and mobile oyster bar The Oyster Cart. Also, expect performances throughout the day by the likes of Shak & The Baits, helmed by home-grown singer-songwriter Shak'thiya Subramaniamm, and Jawn on Saturday.